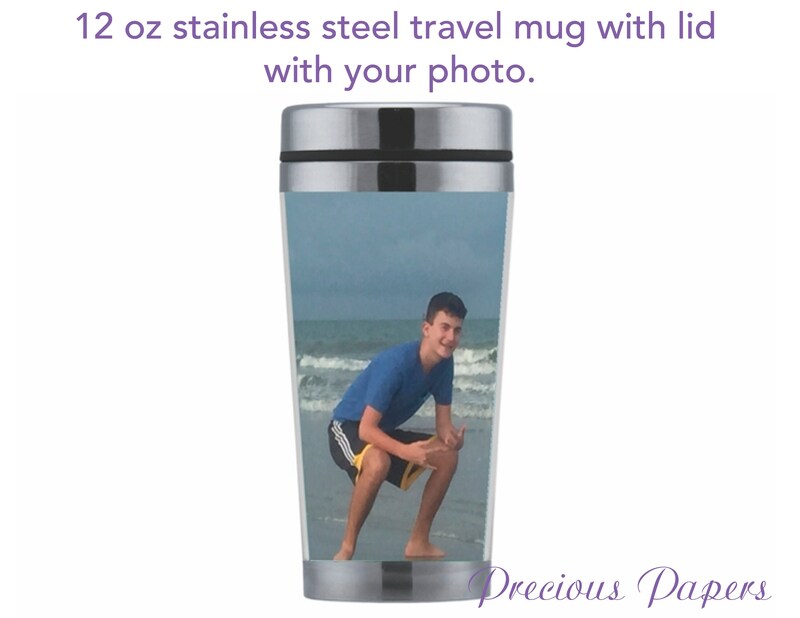 Personalized photo travel mug with lid - photo coffee cup, photo cups, photo gifts, photo coffee mug, mothers day gifts, fathers day gifts. Personalized monogrammed tumblers with a lid. PREVIEW BEFORE YOU BUY ****Do you want to see what it will look like before you buy? Head on over to the design studio and design and preview your item. - personalized with ONE photo of your choice Please email the photo or photos after you submit your order. if I don't here from you, I will contact you for the photos directly. This item does not include a proof,. We will make your cup and ship it upon approval within one business day. All items are shipped US Mail. Due to the personalization of the product we will not accept refunds for this item. Personalized photo Tumblers with lid and straw - photo cups, photo gifts, mothers day gifts, fathers day gifts. The quality of the mug & pictures are great! I got it earlier than said which is even better! We love it! Loved how this turned out! It is perfect...thank you so much. It’s exactly as described. Looks great and my wife loves it!!! on selections when ordering. Overall, I appreciate the great service!! If ever in need of another, I will be back! Immediate payment is required at check out. No order will be started until payment is received. Due to the nature of our product, no returns can be accepted. I will send you a note or a proof that I've received your order within 24 hours of purchase. Your item will be shipped within 1-2 business days unless otherwise notified. All items are shipped via USPS 1st Class Mail. Upgrades are available as requested. I will happily ship straight to a giftee as well as include a personal note as requested, just leave me the info in the note to seller at checkout. While packages generally arrive MUCH sooner, I allow the post office up to 2 weeks for Domestic delivery before resending/refunding for non delivery. Thank you for your understanding! The postal service is a fickle being. Please remember that shipping around any holiday can be very unpredictable and Priority Upgrades are recommended to ensure faster delivery times! Do you send digital proofs? Yes every item offered in the store will receive a proof before it is made. The proof will show up in the conversation area on Etsy. I will not make and ship the item until the proof is approved. However if the proof goes more than a few days I do reserve the right to print and ship without approval so your order is not delayed. Yes every item purchased in the store will receive a digital proof before it is made. The proof will show up in the conversation area on Etsy. I will not make and ship the item until the proof is approved. However if the proof goes more than a few days I do reserve the right to print and ship without approval so your order is not delayed. Please be sure to check your proof carefully before approving. This service is provided for free so you won't be disappointed when the item arrives. Proofs are usually sent within a few hours of ordering ( unless it is the middle of the night ). Once I receive a proof approval from you, items will typically ship the next day. The faster you respond with a proof approval the faster your order ships. U.S. packages are shipped via First Class Mail or Priority Mail based on weight or quantity. Typical shipping times for First Class is 2-5 business days. Priority Mail is 2-3 business days. HOWEVER...These shipping methods are NOT guaranteed by the postal service. These are their "estimations" on package arrival. I can ship UPS which does guarantee their service however it is more expensive. If you need this service please send me a message before ordering so I can check the cost and time. Please order the item you would like as shown. Once you go through the check out it will have a box for "notes". In that box you can give me any instructions necessary to complete your order including the name you would like, the font style, colors etc. I will send a proof after your order is placed so if I misunderstand your instructions we can fix it before printing. Due to the differences in computer monitors and phone screens the colors may differ from what is printed on the items. Due to the personalization of all of our products we will not accept refunds or exchanges. The responsibility falls on you to check the proof carefully for mistakes. Yes, almost all items in the store can be modified with font style, font color, artwork color, wording, the list goes on. If you have a special request just send me an email. I love a challenge!! I can add a gift message to your item and ship it directly to the recipient. Please add this to the notes area on the order and also remind me when you send your proof approval. I do not send invoices with any of my packages so your recipient will not know the cost of the item.